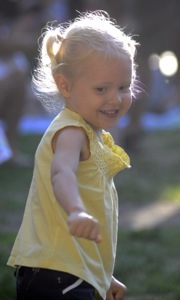 Was it just our imagination or was there a proliferation of the 10 and under girl set – complete with happy smiles – out on the dance floor at tonight’s summer music concert in Menlo Park’s Fremont Park? On stage was Fito Reinoso, who has “made the Bay Area his home and is the only Cuban-born based sonero in the area performing a variety of styles, from the most recent urban Havana grooves to ‘timba’ to the classic son and cha-cha-cha, all with a voice reminiscent of the late and beloved legendary Cuban singer, Beny Moré, ” according to Latin Pulse Music. If you were lucky enough to be in the sun, it was almost possible to channel being on the island itself (without the humidity, of course). Next post: Waffle innovation trumps pizza startup model?